This green wonder has the ability to give an instant energy kick for it contains plantbased iron and a natural and magical colouring named chlorophyll, the green colour in green (leafy) vegetables. In fact all the breathing you do on and off your yoga mat is supported by chlorophyll. It carries oxygen all the way into your cells where it ignites vibration & energy. I love everything about broccoli. Its vibrant green colour, its cute tree and lung-like appearance, its slightly bitter taste and its yummy crunchy texture. (at least when you don’t overcook it!) This green wonder has the ability to give an instant energy kick for it contains plantbased iron and a natural and magical colouring named chlorophyll—the green colour in green (leafy) vegetables. In fact, all the breathing you do on and off your yoga mat is supported by chlorophyll. It carries oxygen all the way into your cells where it ignites vibration & energy. Its lung-like appearance all of a sudden makes extra sense. Broccoli is a lean mean lung-supporting breathing machine! On top of that it contains a substance called Kaempferol which lessens asthmatic problems and heals inflammation of the respiratory system. Broccoli’s healing factor is increased by eating it in the form of broccoli sprouts or by steaming it for four to five minutes. So let’s steam, eat, breathe, energize and practice brocc-asana! Soak quinoa overnight* in lukewarm water with a little salt. Strain & rinse the next day. Place in pan, add fresh water & cook for 8 minutes. Turn heat off, remove any excess water, place lid back on & let sit. Cut broccoli in small florets. Remove skin from red onion & chop in rings. Place broccoli & onion in pan with steam basket. Make sure there’s at least 1 inch of boiling hot water on the bottom of the pan. Place lid on pan & steam for 3-4 minutes. The broccoli should be bright green. Take veggies out of pan & let cool. Use sharp knife to slice florets lengthwise. 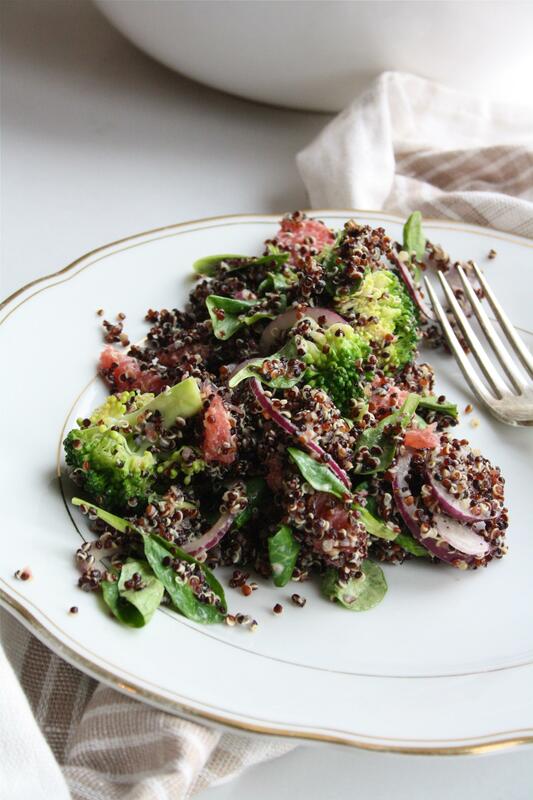 Place cooled quinoa, broccoli & onion in large bowl. Remove skin from grapefruit & cut in segments disgarding the white parts. Add to bowl. Squeeze out the leftover grapefruit core & add juice to bowl. Use (hand)blender to make a creamy dressing from tahini, hot water, tamari, seasalt & syrup. Add to bowl & use hands to gently disperse dressing. Mix in purslain or spinach. Sprinkle with seasalt (optional). Serve. TIPS: *lack of time? You can also skip the soaking & cook quinoa straight from the packet. bored? soak quinoa overnight, sprout for 2-3 days, then cook. this way your quinoa becomes even more nutritious than it already is! You can easily make this meal ahead of time, put it in a mason jar, refridgerate & take along with you for lunch. Kyra is an activist for health & happiness. This published writer of (culinary) articles and books, certified naturopath specialized in nutrition and lifestyle, yoga teacher and developer of inspirational food & health projects, is somewhat a hippy idealist. But that said, a hardworking one with the ability to realize her dreams and ideas. Kyra’s work has been featured in magazines such as Marie Claire, Happinez, happi.food, Flair, Delicious., ELLE Food, Yoga Magazine and Cosmopolitan. She’s been named one of the most inspiring women of 2014 by glamour magazine and won an award for her vegan cookbook kyra’s kitchen. Kyra has trained Michelin starred chefs, developed a recipe book for popular tea brand yogi tea, was head chef at her very own pop-up restaurant peas and is a professional hammock lover. Her brand new e-book cookbook ‘healing meals’ is out now and available here. Lotus root is an incredibly powerful natural medicine. It helps to establish mental balance and peace of mind and is a potent vegetable to use after dis-ease, hard physical labour or a sweaty yoga practice. Its protein, electrolytes, copper and iron support your body to recover and build energy enhancing red blood cells. Much of what we do is done in a routine-like, almost automatic, kind of fashion. We get up in the morning and assume the familiar pattern of iPhone, shower, dress, coffee, go. We drive to work taking the same route over and over again. We grocery shop a bit tired and uninspired, always choosing the same products. We cook quick hurried meals, for the day has been long and stressful. Hence our tendency to eat our dinner at ‘workday pace’: somewhat fast and furious.